Many science projects investigate a combination of independent and controlled variables to see what happens as a result - the dependent variable. To get reliable results from your experiments, you change the independent variables carefully and the controlled variables as little as possible; this ensures that only the things you're interested in affect your experimental results. Does Sugar Dissolve More Quickly in Warm or Cool Water? Heat a cup of water while allowing another cup of water to remain cool. Dissolve one teaspoon of sugar in each cup of water. The controlled variable would be the number of times and the pressure used to stir the mixture because added motion of the water may or may not dissolve the sugar more quickly whether the water is warm or cool. Record the amount of undissolved sugar in the bottom of the container. Does a Plant Grow Better in Direct or Indirect Sunlight? 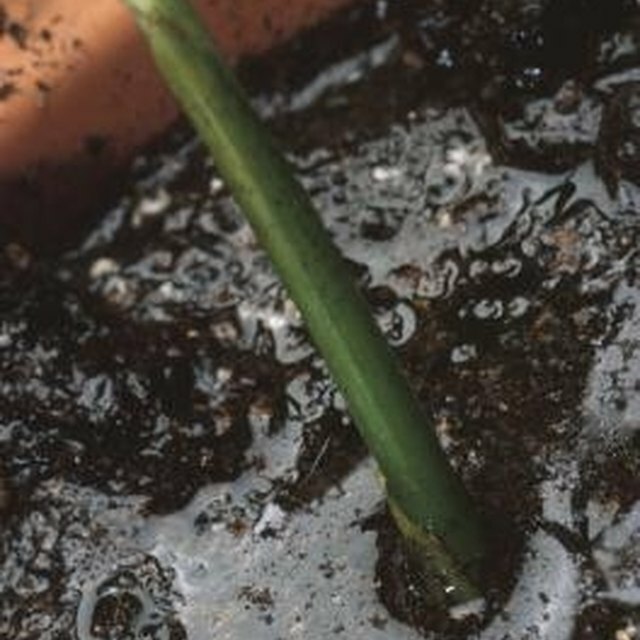 A science project involving plants has controlled variables in the amount of water given to each plant and the amount and kind of soil in which the plant is living. Place one plant in direct sunlight and the other in a shaded area or indoors to conduct the science experiment. Record daily results in the height of the plant. Will a Baby Bunny Grow Bigger When Fed Rabbit Food or Fresh Vegetables? Two rabbits, ideally from the same litter, can be used to conduct a classroom experiment. Give each rabbit a different diet: one of only fresh vegetables such as lettuce, carrots and celery; feed the other rabbit pellets from the pet store. The controlled variable in this experiment would be the weight in food each rabbit receives even though the type of food is different. Record the height, weight and length of the two rabbits each week. Which Will Clean a Penny Faster, Water or Vinegar? In two glass containers, place one cup of distilled water in one and white vinegar in the other. Carefully drop a dirty penny into each container of liquid and record the changes in the penny's appearance over the course of one week. The controlled variable is in the amount of liquid used to clean each penny. Dawe, Trisha. "Ideas for Controlled Variable Science Projects." Sciencing, https://sciencing.com/ideas-controlled-variable-science-projects-7875543.html. 28 April 2018.